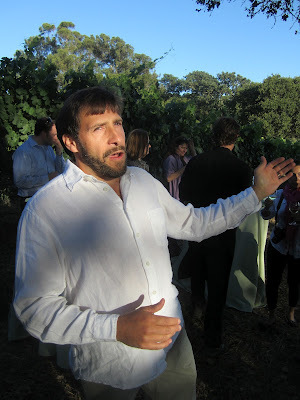 The Wines of Hyde de Villaine: A Slice of Burgundy in the Heart of Napa! During our trip to California last month, we had the pleasure of discovering a very special yet easily overlooked gem nestled among a landscape of grand entrances and impressive architecture in the Napa Valley. Hyde de Villaine, or HdV, is an unassuming winery with a very impressive pedigree. It is first and foremost a family affair, representing a collaboration between Hyde Vineyards of Napa Valley and Aubert and Pamela de Villaine of Burgundy. The connection? Aubert de Villaine's wife, Pamela happens to be Larry Hyde's first cousin. Larry Hyde was born into one of California's oldest farming families and brought his love of wine and soil to the Napa Valley over thirty years ago. In 1979 he made the decision to purchase the land in Carneros that would later become Hyde Vineyards, and his career has been devoted to the expression of Carneros terroir. Aubert de Villaine is one of Burgundy's most well-known and respected individuals. He is proprietor of one of the world's most legendary wine estates, Domaine de la Romanée-Conti, also referred to as DRC, which produces some of the world's most renowned wines, which also happen to be some of the most expensive. In addition to DRC and HdV, he also owns and operates A & P de Villaine with his wife Pamela in Bouzeron. To their partnership in the Napa Valley, de Villaine brings the foundation upon which HdV bases its theory and practices. During our visit to the winery we had the pleasure of meeting Stéphane Vivier, winemaker for HdV since 2002. The charming and affable Vivier was born and raised in France and has studied winemaking and viticulture in Burgundy a number of other countries around the world including Switzerland, New Zealand and California. His goal as winemaker is to channel the nuance and elegance of Burgundy through the prism of exceptional California fruit and Carneros terroir. 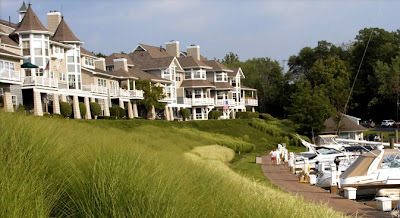 HdV was established in 2000 and definitely falls into the category of a boutique winery. 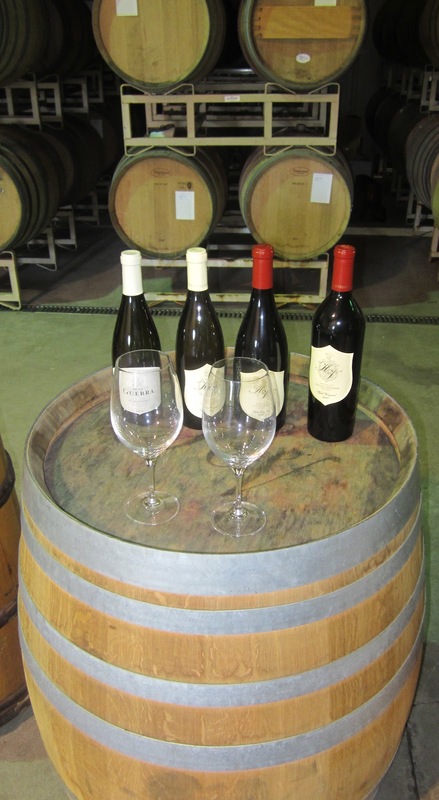 The winery's total yearly production is just 3,000 cases with all of the fruit being sourced from Hyde Vineyards. Vivier shared much about the history of the winery and guided us through a delightful tasting of the HdV wines. There is a rich historic legacy behind the wines of HdV. Featured prominently on the bottles is a coat of arms representing the de la Guerra family, one of the oldest documented families in California. Pamela de Villaine and the Hydes are descendants of this family and the presence of the coat of arms is meant to symbolize the sense of tradition, family and winemaking history embodied in this endeavor. Our tasting of the HdV wines began with the 2010 De La Guerra Chardonnay ($45). On the nose were inviting aromas of citrus and minerals followed by a fresh and focused palate featuring subtle nuances of oak that beautifully highlighted the wine's floral and citrus notes. Made from from 15-17 year old vines this wine was aged in a combination of neutral oak, concrete egg and stainless steel for eight months. Vivier eschews the use of batonnage or lees stirring and has refrained from using it since 2005. His reason? 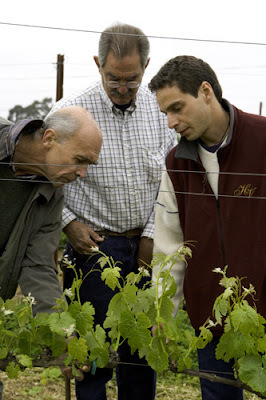 To truly capture the Carneros terroir in the glass, not the winemaking. He likens battonage to makeup used to conceal flaws and stressed the importance of doing the work in the vineyard in order to avoid compensating through various winemaking techniques. This wine demonstrated a delightful integration of Burgundian elegance and California opulence. Next was the 2009 HdV Chardonnay ($60) crafted from 20-30 year old vines. A study in restrained elegance, this wine had subtle notes of citrus, stone fruit and spice with a lovely mineral character. It was aged for 15 months, 12 months in oak (20% new) as well as stainless steel. Vivier stressed the importance of stainless steel in the production of his Chardonnays explaining how it, "brings focus to the wines." The '09 Chardonnay is also unfiltered and unfined further demonstrating his "hands-off" approach to winemaking that truly lets the exceptional Hyde vineyard terroir shine through. Like the '10 De La Guerra, this wine was beautifully balanced although with more complexity. Our first red wine of the tasting was the 2007 HdV "Californio" Hyde Vineyard Syrah ($50) whose name refers to the early California settlers or "Californios" who brought Old World sophistication to the Western shores of the US. This lovely Rhone-inspired selection was crafted from 12-15 year old vines and was rife with notes of black currant, roasted herbs and black pepper as well as a lovely minerality. As with each wine before it, it was well-balanced and very approachable although it could benefit from some bottle age as well. When asked what dish he would recommend pairing with this wine, Vivier had two different yet delicious suggestions: Ahi Tuna with soy sauce and sesame oil, or the French classic Blanquette de Veau. Our final wine of the tasting was the 2007 HdV Belle Cousine ($60) which translates to "beautiful cousin," so named for Pamela de Villaine, Larry Hyde's first cousin. A Bordeaux-inspired blend of 60% Merlot and 40% Cabernet Sauvignon this wine exhibited enticing notes of black currant, sweet cedar and spice along with firm, chewy tannins. Much like the Syrah the '07 Belle Cousine was approachable yet would also benefit from some additional time in the bottle. As with all the other wine we sampled, the Belle Cousine was deliciously food friendly and had me instantly craving roasted lamb. If you are a fan of Burgundy or enjoy a more restrained, elegant style of wine, the wines of Hyde de Villaine are a definite must! 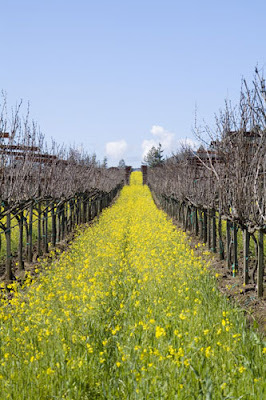 A big thank you to Stéphane for taking the time to meet with us and if you happen to be out in the Napa Valley be sure to add a stop to HdV to your itinerary. 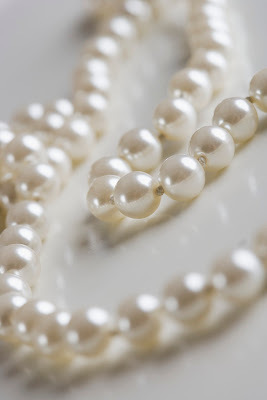 "How to Be a Gracious Houseguest" by Loretta Neff of The Elegant Way School of Protocol! Today I'd like to introduce you to a very special lady who has agreed to do a guest post for The Glamorous Gourmet. Loretta Neff is the President and Chief Etiquette Officer of The Elegant Way School of Protocol - she also happens to be a really fabulous person as well! Loretta is one of those people who is innately blessed with impeccable taste and style and is a bona fide authority on all things elegant. I've asked her to write about a relevant topic for many South Florida residents: the virtues of being a gracious houseguest. 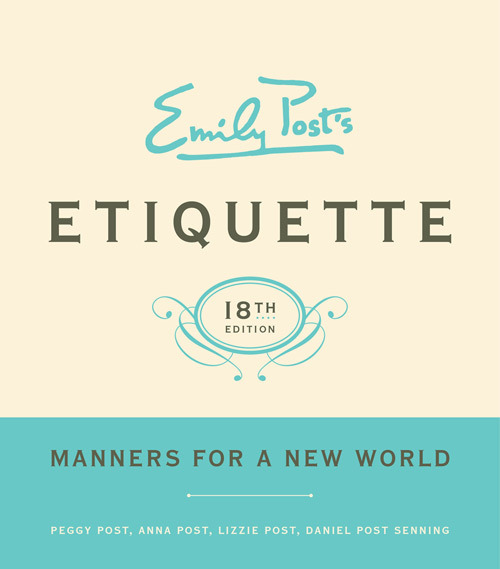 Whether we have friends and family visiting us during the fabulous Florida season or it's us doing the visiting during the blazing hot Summer months, it's always good to be armed with etiquette - especially if you want to be invited back! So without further ado, here is Loretta's advice for being the best houseguest you can be. 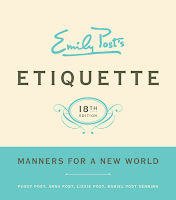 For more information on all things relating to manners and etiquette please check out Loretta's website at www.theelegantway.com. "Everyone Loves a Gracious Houseguest"
During the summer, the big question everyone asks is, “Have any special plans?” Most people answer with a resounding, “Yes!” and then they begin to tell you all about them. Special plans can run the gamut… from house parties, sports outings, family vacations, romantic getaways to metropolitan cities, exotic ports, old-world countries, and underdeveloped regions. For some, the itinerary may be as simple as spending quality time with family and friends. And for others, the itinerary may be as elaborate as boarding planes, crossing major oceans, and traveling through multiple time zones to seek adventure, marvel at a piece of history, or immerse themselves into another culture. Whatever your pleasure, should any of your plans involve the good fortune of being a houseguest, you may wish to refresh your memory with the tips that follow to ensure a harmonious stay…and perhaps another invitation in the future. If you’re an early riser and your host is not, be sure to discuss preferences for making coffee or tea, and learn where things are kept. 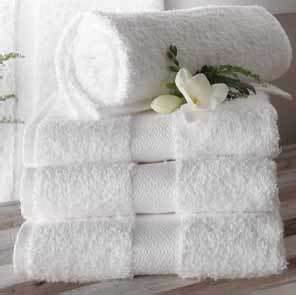 Most often your host will tell you where food and beverage items are so that you can help yourself. If your host doesn’t, then you should ask permission ahead of time. If you are given the use of a car, be sure to have it cleaned and refueled upon return. Most importantly, honor your departure date. Upon your departure leave a bedside note and small gift, or send them once you’ve returned home. The advantage to the latter choice is that you’ve had a chance to observe the decor and learn about their objects of affection, so a gift idea is made easier. For longer stays, you should expect to contribute to household duties and grocery items, and purchase a significant gift. Gifts may include one or more of the following: Soaps, Candles, Wines, Champagnes, Chocolates, Coffee, Tea, Jams, Monogrammed Guest Towels, Table Books, or Gift Certificates. Ask to bring your pet. The South Florida Premier of "El Camino del Vino" featuring World-renowned Sommelier Charlie Arturaola! We recently celebrated the second anniversary of "The Art of Wine and Food" series at the Museum of Art Ft. Lauderdale and I'm happy to announce we have another very exciting event planned for next week! On Thursday, August 23rd we will feature the South Florida Premier of "El Camino del Vino" a film directed by Nicolás Carreras and starring world-renowned Sommelier and South Florida resident Charlie Arturaola. The movie is a fictionalized documentary based on Arturaola's life and filmed in Mendoza, Argentina and Montevideo, Uruguay. The film, whose title translates to "The Ways of Wine," tells the story of Arturaola, a real-life Uruguayan sommelier and one of the top sommeliers in the US, who loses his palate while presenting Mendoza's Masters of Food & Wine Awards. The film strikes a great balance between the comic and the serious as it depicts Arturaola's journey of self-discovery on his quest to regain his palate. The film has been very well-received, garnering the prestigious FIPRESCI (Federacion Internacional de la Prensa Cinematografica) at the Mar del Plata Film Festival in 2010. In 2011, the film screened in the prestigious Kino Kulinarische program at Berlinale, at the newly established Transatlanyk Film Fest, as well as at Enologica 32 in Montefalco. The US premiere was at the Napa Valley Film Festival and the film is scheduled to screen in London and the Melbourne Film Festival in August. In addition to his extensive world travels, Arturaola also has long standing ties to South Florida. Prior to founding his own global wine consulting company Grappolo Blu, he held positions as Wine Director at the Boca Raton Resort & Club and taught wine at both Lynn University and Johnson and Wales University in Miami. 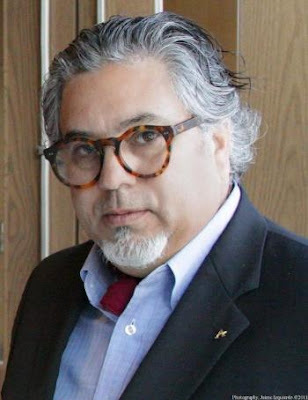 In addition to being named "One of the Nation's Top Ten Palates" by the American Sommelier Association, Charlie's impressive list of credentials includes positions as a featured sommelier and educator at many of the country’s greatest wine festivals, including Aspen, CO; Naples, FL (as a founding sommelier); Napa, CA; and Jackson Hole, WY. Charlie was also recently honored with the 2012 International Wine and Spirits Competition Communicator of the Year Award, sponsored by Vinitaly. The award recognizes an individual whose communication skills in the last 12 months have made an exceptional contribution towards promoting and increasing public awareness and interest in wines and spirits. To read more about Charlie, please visit his website at www.charlieswines.com. At the premier of "El Camino del Vino" on the 23rd, guests will enjoy a screening of the film followed by a reception featuring a selection of Argentine wines, authentic Argentine cuisine from Gaucho Ranch in Miami, as well as a Q & A with the Arturaola himself. Cost for the evening is $50 per person and reservations are required. To RSVP please call 954-262-0249 or e-mail gvilone@moafl.org. For a sneak peek of "El Camino del Vino" please check out the trailer below. We hope to see you there! Not So Fast but Definitely Fabulous: Grilled Shrimp & Avocado Panzanella! The other day my husband approached me with a mischievous grin and a gleam in his eye. Yes, you guessed it, he had just found a recipe he was very excited to try! This particular recipe featured mouth-watering, Summer-inspired ingredients including creamy avocados, fresh shrimp and ripe tomatoes. The fact that it involved the grill made it a shoe-in! Panzanella is a Tuscan salad which traditionally includes tomatoes and chunks of soaked stale bread that's very popular during the Summer months. The tomatoes and bread are usually accompanied by onions, basil and a vinaigrette of olive oil and vinegar. I have to say the flavors of this dish were absolutely phenomenal but I tweaked the ratio of ingredients slightly to maximize the fabulous flavor and balance out the "carb factor." This dish also lends itself well to cooking "a deux" which also cuts the prep time in half. Steve and I had alot of fun prepping our respective "components" although somewhere along the way I got roped into chopping all the garlic...hmmm. Anyway, a couple helpful hints for preparing this dish, be sure to make the tomato, avocado and onion salad last and shortly before serving or your avocado will turn brown. You also want to combine all of the ingredients shortly before serving - panzanella salads are prone to getting soggy. I do have to say though, this dish was surprisingly delicious the day after! As for wine, a crisp, chilled Italian white would work nicely with this panzanella salad. If you're feeling a little adventurous, opt for a Vernaccia di San Gimignano from Tuscany or an unoaked Ribolla di Gialla from Italy's Friuli-Venezia Giulia region instead of a standard issue Pinot Grigio. I hope you enjoy this salad as much as we did. It will definitely be on the rotation at our house for the rest of the Summer and beyond. Also, keep this dish in mind for entertaining - your guests will love it! Vinaigrette: in a small bowl whisk together the olive oil, lemon juice and garlic. Season with salt and pepper to taste. Reserve. Bread: In a small bowl, whisk together the olive oil, garlic powder, oregano and salt. Cut the sourdough French bread into thick slices (approx. 1 1/4 inches thick). Brush both sides of each slice generously with the oil mixture. Set aside. Shrimp: In a large bowl whisk together the olive oil, lemon juice and black pepper. Add the shrimp and toss to coat evenly. Now, you're ready to grill! Add bread slices to your pre-heated grill and toast for about 2 minutes per side. While bread is toasting, arrange the shrimp on the other side of the frill. Cook the shrimp until just pink and firm, about 2 minutes per side. Remove the bread to a cutting board and cut into bite sized cubes. Transfer the bread and cooked shrimp to a large serving bowl. Add the tomatoes, avocados and onion and toss gently. Drizzle the salad with the vinaigrette then genly toss again to mix well. Serve immediately. "A Moveable Feast" with Napa's Truchard Family! We're back from California and a journey packed with many memorable vinous experiences! While there's many new discoveries and things I look forward to sharing with you, I'd first like to tell you about an amazing evening spent among the vineyards in Carneros with one of Napa's pioneering wine families. 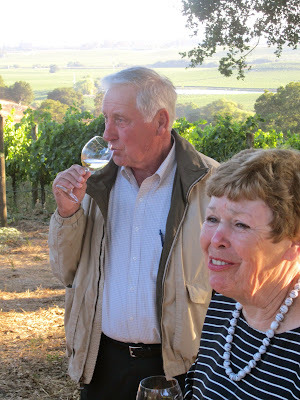 Our friends Monty & Sara Preiser kindly invited us to "A Moveable Feast" at Truchard Vineyards. The evening was part of an auction package they'd purchased at the 2012 Boca Bacchanal, an event Steve and I chaired. We were honored and delighted that they included us. While looking forward to the evening, we really had no idea of the adventure in store for us! This actually turned out to be the first time the Truchards had done this particular format of dinner, which made it that much more special. Upon arriving at Truchard Vineyards we were greeted with a lovely reception featuring sparkling wine from Domaine Carneros and delicious passed hors d'oeuvres. Our resident hosts were Dr. Tony and Jo Ann Truchard, patriarch and matriarch of this wonderful family which has played a significant part of Carneros history since the 1970's. Also representing the Truchard family was son Anthony and his lovely wife Suzanne. The Preiser's son Justin and daughter-in-law Stacy were also in attendance and celebrating Stacy's birthday which further contributed to the festive feel of the evening. It was a cool, clear beautiful night and the setting was charming, enhanced not only by the Truchard family pet cats but also their adorable pet goat Rocky. Soon after making everyone's acquaintance and sipping and savoring the welcoming offerings, Anthony Truchard revealed the master plan for the evening. Before long we were being whisked up winding vineyard roads in a convoy of SUV's to our first "course" - it was a "Moveable Feast" after all! Steve and I were very fortunate to ride with Jo Ann Truchard behind the wheel, and with the golden, wine country sun making its descent on the horizon, we got to hear firsthand how the Truchards, Texans prior to moving to California, happened into the wine business. "I slipped on a grape at the grocery store and broke my leg when I was nine months pregnant with my second child!" Jo Anne said. "Tony [an Army physician] was supposed to ship out to Korea but he couldn't leave after that. I gave birth a few days later with a full cast on my leg." Instead of going to Korea, they ended up stationed in Herlong, California and eventually purchased their first 21-acre plot of land in Carneros. Soon after they realized growing grapes was going to be much more than just a weekend project! Since then, Truchard Vineyards has grown to 400 contiguous acres and is one of Napa's most diverse estates growing 10 different grape varieties. The family keeps only 20% of their fruit to make their estate wines, and sells the other 80% to 20 of Napa's most well-respected producers. Listening to Jo Ann talk about her family's history in this very special part of the world was certainly a treat for us as her passion was clearly evident. Soon the convoy was parking and we were delighted to hear our first stop was among the Roussanne vines. Roussanne is a white grape variety primarily grown in France's Rhone Valley yet does remarkably well on the Truchard land as well. As we disembarked we could see a clearing in the vineyard set with lovely high top tables. The view of the rolling hills in the distance, the Roussanne grapes hanging on the vine, and the sun in the distance was truly breathtaking. The "Roussanne Vineyard Course" featured a delicious Scallop and Spot Prawn Salad with Vanilla Citrus Essence which paired beautifully with the 2010 Truchard Vineyards Roussanne. It was a magnificent start to our feast! Our next stop took us through even more scenic, winding roads to a clearing in the vines overlooking more beautiful vineyards and Boot Lake, so named for its shape. As we emerged from the trucks, we were guided to a beautiful table decorated with assorted squash and gourds from the Truchard's garden. While enjoying the fabulous company and a picture-perfect Carneros sunset we enjoyed two more delicious courses. "Pork and Pinot" featured Pork Three Ways served with Rancho Gordo White Beans and Salsa Verde that paired beautifully with the 2009 Truchard Vineyards Pinot Noir in addition to some other special bottles the Truchards had brought. This dish was also accompanied by freshly baked bread served with the Truchard Vineyards Extra Virgin Olive Oil made from olives grown on their property as well (Martha Stewart has nothing on the Truchards!). Next was the "Lamb and Cabernet Sauvignon" course featuring perfectly charred, juicy Dixon Spring Lamb Chops with Caramelized Garden Beets, Black Olive Sauce and Blood Orange Extra Virgin Olive Oil. This dish made my husband Steve particularly happy and the lamb paired famously with the 2008 Truchard Vineyards Cabernet Sauvignon. I have to mention the amazing food for the evening was prepared in sight by the fabulous folks at Smoke Open Fire - truly extraordinary! Once the sun had set and the crescent moon made its appearance in the sky it was time to head back to the estate. Our evening wasn't over yet though - far from it in fact! Back at the estate we were guided into the impressive Truchard wine caves where another beautiful table awaited with our dessert course. A selection of delicious Northern California Cheeses, fabulous handmade cookies, and decadent chocolate strawberries were served with the 2007 Truchard Vineyards Roussanne Botrytis and French Press Coffee. Needless to say all in attendance were sufficiently satiated and awed not only by the wonderful and unique experience but also by the charm and graciousness of the Truchard family. I also have to give a special mention to Linda Carr who has been with the Truchards since 1998. Linda played an intrinsic role in the planning and execution of our evening and I just had to sincerely applaud her efforts. Following dessert the Truchards fired up the traditional Texas fire pit and invited the Preisers to make some selections from the family's wine library. As we enjoyed the warmth of the fire and lovely aromatics of the burning Eucalyptus wood we enjoyed some more very special wines that had, like this amazing family, thrived with the passing of time. A big thank you to Monty and Sara Preiser for including us in such a special evening and to the Truchard family for their gracious hospitality!